Julian J. Rimoli is an Assistant Professor of Aerospace Engineering at the Georgia Institute of Technology. Dr. Rimoli obtained his Engineering Diploma in Aeronautics from Universidad Nacional de La Plata in 2001. He moved to the United States in 2004 and pursued graduate studies at Caltech, receiving his M.Sc. in Aeronautics in 2005 and his Ph.D. in Aeronautics in 2009. He then accepted a postdoctoral associate position at the Department of Aeronautics and Astronautics at MIT in Cambridge, MA, where he conducted research and supervised graduate students for over a year and a half. In January 2011, Dr. Rimoli joined Georgia Tech as Assistant Professor of Aerospace Engineering. 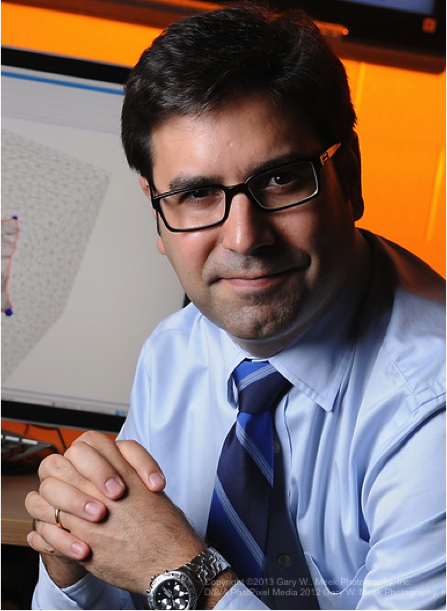 His research interests lie within the broad field of computational solid mechanics with particular focus on aerospace applications. Dr. Rimoli has a special interest in problems involving multiple length and time scales, and in the development of theories and computational techniques for seamlessly bridging those scales. He is a member of AIAA, ASME, and USACM and is the recipient of the NSF CAREER Award, the Donald W. Douglas Prize Fellowship, the Ernest E. Sechler Memorial Award in Aeronautics, the James Clerk Maxwell Young Writers Prize, the Loockheed Dean's Award for Excellence in Teaching, and the Goizueta Junior Faculty Professorship. Prof. Rimoli's publications are listed in his Google Scholar profile. Detailed information about his research and teaching interests is available in his Curriculum Vitae.